pperseverence, prayer, presence, priorities, Self Care, sin, Spiritual Dryness, Spiritual Health, Spiritual Warfare, Time, Try? If prayer is the most powerful thing we can do as human beings, in fact by is an instinctive response, yet why is it something we all struggle to do? It is said if you want to make your congregation feel guilty “talk about prayer”. we all know we should do it, but probably none of us does it as much as we should, or even as we would like. we claim to be too busy, but in reality that is about priorities, we can always make time, but the truth is we don’t always. The illusion of to busy, or too tired, or a distraction there are so many things that just pull us away for a few seconds, and we never get around to doing that important thing of actually praying. Intending to pray is not actually the same as praying. Then as I began to think more about prayer, not only is it hard sometimes to do, we need to make the effort, grasp the moment and maybe even do that unfashionable word of self discipline/Spiritual discipline, to challenge ourselves to do that which we know we should. Yet I wonder too, how often we don’t pray because we are comfortable and the urgency or necessity to pray doesn’t really grab us, we think we’ll be okay and our comfortable western lives often cushion us to forget our dependence on God. Even theological truths of lost eternity or human compassion don’t always force us to our knees until God has our hearts fully, and paradoxically, if we don’t pray we never give God our hearts or let him have ours. I think the real reason the Church in the west is failing is actually because Christians aren’t praying. God says “You have not because you ask not”. 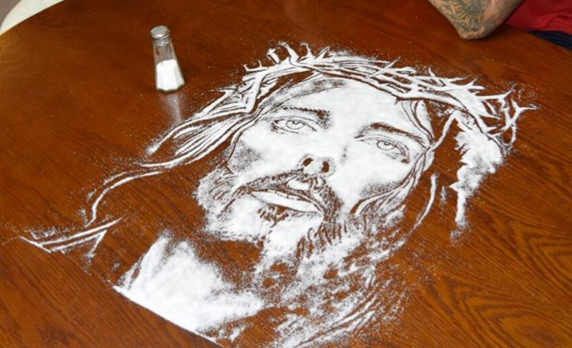 Jesus talks about us being like “salt”, the idea is to make us thirty for God, and yet too much of the Church seems comfortable and complacent. I think too, we struggle to pray because of fear and lack of faith, we fear disappointment, we fear getting our hopes raised -even sometimes we fear God answering our prayer. I remember that terrified moment when I felt “wow, God is actually real” as he answers prayer shocks and shakes us from our complacency. The pain too of seemingly unanswered prayer, when heaven seems to be silent, and times of suffering and confusion can cause us to struggle too, and ask where are you God. Too often we think that in the Christian life we will always get a charmed life and always have a parking space, where in reality it is tough, confusing and painful. Often too our own sense of guilt, apathy, sin, pride can all keep us away from God’s loving arms, these times when perhaps it is easier to run away from God is the exact time we need to instead run to him. For me, one of the best ways to keep me praying has been personal accountability, over the last 20ish years -sometimes more regularly than others- I have had some great guys who I have met up with too pray, and without that companionship on the journey I don’t think I’d have made it this far. Also, I need to be reminded that prayer works, that God answers, my soul needs to HEAR the stories of peoples encounters with God, or prayers answered and God speaking. we need these stories to spur us on. Yet we also need to TELL those stories too when God meets and speaks to us, answers our prayers, we need to share it too. So, the challenge for us all is let’s not just talk about prayer, as though it is a good thing to do. Let us not even intend to do it. Let us be people that actually pray. I used to have an intern called Sam. He loved biblical bit parts, those characters that only appear a few times but whose appearance is significant. He also had a quirky sense of humour and loved it if they had a name that sounded funny Phinehas (pronounced according to Sam as ‘Fine-arse’) made worse (or better depending on your perspective) by the fact that this fella came from Shittim! Another of Sam’s favourite stories was the story of David dancing before the Lord in his Pants (see Undignified worship blog previous). Yet there is a character both he and I missed, his name is Obed Edam, and he was a Gittite. Sam how could you miss this? Perhaps we were distracted by the reigning monarch dancing before the Lord in his pants that we didn’t spot this fantastic unsung hero. Obed Edam, at the start of the story is just a normal guy with a family and a house near a main road, nothing special really. Yet the Ark of the Covenant is being carried back to Jerusalem on a cart, it was never meant to be carried by cart, God gave the people clear instructions about how to transport it, but they were so excited about the Arks return they ignored them. Uzzah, a servant, places his hand on the Ark, when the Ox stumbles, and he is struck dead. I wonder when I read passages like this, perhaps we forget how awesome and powerful God is, my friend Mark Rich sometimes talks of the ‘fear of the Lord’ and this would be a good passage to read to remind us not to play fast and loose with God and his word. King David, who is heading up this procession suddenly gets a bit nervous, and wants to get rid of the Ark as soon as possible. Sometimes when we are reminded of the reality and the power of God we sometimes flee from him because we know of our sinfulness. The Israelites wanted Moses to be an intermediation between them and God, they didn’t want to face him. The Priests were attached to a rope so they could be pulled from the Holy of holies if they were struck dead. Simon Peter at the great catch of fish said to Jesus “Lord get away from me for I am a sinful man”. David flees from Gods presence and asks Obed Edom to take care of the Ark of the Covenant in his house. Imagine the feelings Obed Edom must have had. “Caught somewhere between wonder and fear, he must have thanked God for this unspeakable honour of his presence with one breath and begged God to spare his life with the other.More than a thousand years before the cross of Christ, Obed-Edom was forced to gamble his life on grace”. Yet we see Gods presence and blessing resting on Obed-Edom, and then eventually David plucked up the courage to take the Ark back to Jerusalem. Yet this isn’t the last we hear of Obed-Edom, he pops up as a temple porter, a temple singer and finally as a treasurer in the Temple. I believe that once he had experienced something of the presence of God he couldn’t live his life without it (1 Chr. 15:18, 21; 2 Chr. 25.24). It made me wonder how desperate I am for Gods presence? Do I crave to be in the presence of God? Am I hungry for more of God than I have previously experienced? Or am I like David and want an ‘arms length God?’ that is a bit distant, aloof and impersonal? A Psalm-writer talks of “better is one day in your courts than a thousand elsewhere”, is this how we live? Moses had been in the presence of God that his face shone and he had to wear a veil, when we have been in God’s presence it shines out of us, people notice the difference. Yet as I began to think about this story, Obed-Edom didn’t just have a visitation of God, a theophany, but rather he had habitation, Gods presence dwelling with him. what of us and our Churches, are we happy with the Holy Spirit visiting us every now and again, or are we seeking and longing for habitation, God is in this place, God is dwelling with his people. One of the names for Jesus is “Immanuel” which means “God with us”, Pentecost means that the Holy Spirit is in us and with us for all time, never to leave us or forsake us, we approach the throne of God with boldness, not just for an encounter but to transform our lives as he lives in us and through us. Let us be like Obed-Edom, with an insatiable thirst and hunger for more of the powerful presence of God. Jesus is welcome but Guilt isn’t! It has been tough at our Church(es) of late. There have been times when I have really felt a bit of a failure as a Vicar, if I’m honest. We split our services a while back and new people have started coming (but very slowly) but also some have left, in fact more have left than have joined, which is tough. Also, have been keen to encourage other people to run with what God has put on their hearts, which I think is what leadership is all about, but we currently have a small Church with lots of opportunities to join in with. Again, I feel guilt, and I feel guilty that am I unintentionally making people feel the unspoken weight of expectations. -That said, I do think God is challenging some parts of his Church about Apathy, but I guess if I have a rant about Apathy the people who are least apathetic and most faithful will probably end up feeling guilty, and those who probably need the kick up the bum wont, ironic isn’t it! A book I’ve been meaning to read for a while (because it has such a great title!) is “driven beyond the call” and that certainly not what I want for people. It is easy to feel guilty. -Or at least I find it easy to feel guilty, other people have a different mindset and might be reading this blog with a frown thinking this isn’t me at all, if that is you, praise God, we are all unique and you may struggle with something I don’t, and that’s okay, different things effect different people differently, but we are all loved and precious to God. In fact I feel guilt when someone treads on my foot in the supermarket! As I prayed God reminded me that success isn’t the goal, but rather faithfulness is, are we in step with God? It is important to remember that God doesn’t judge me on my productivity, but rather his love for me is constant and unchanging, he cannot love me anymore, nor will his love for me diminish. The Bible says that there is “No Condemnation in Christ Jesus”. There is conviction, and sometimes people get a bit confused, conviction is from the Holy Spirit, and comes from his awesome love for us. The Holy Spirit and the weight of other peoples expectations, or pressures are different things, but many of us can blur them in our minds, pray the “Holy Spirit of truth leads us into all truth” and away from false guilt and condemnation. Guilt has no place in the Christian DNA, but is a trait amongst those who want to do the right thing, sometimes good attributes can have something of a shadow-side. This made me think of some of our early meetings of the Church plant, the first “meeting” was held in a car park, on a wall paper paste table, doing communion outside as a prophetic act remembering that Jesus shed his blood and died for this area, that Jesus is good news for this area, and we wanted people to encounter Christ crucified and Christ resurrected. Early days we didn’t know if anyone other than Sam and I would turn up, although we have had some low numbers we have always been more than 2! We said then as we were lugging a great big sound system around, that we will set it up -in faith- for anyone who wanted to hear about Jesus, even if it was just one person, then it was worth it. This reminded me of my prayer yesterday morning, when I felt God say, what matters is not the stuff, not the numbers, but “Am I here?” is Jesus in the midst of us? Last night we sung a song with the line “A Church that is known for your presence again”, which is what it is all about, the presence of Christ with his people, I’d rather have 2 people and Jesus with us, than a crowd of thousands and no presence of Christ. So, as I prayed yesterday, a reminder that whatever happens, however small we become or large to grow into, what ultimately matters is are we welcoming and hosting the presence of Christ? And if I feel guilty, I need to prayerfully challenge my mindset. We have been continuing our work with Pints of View, being available for people to talk to us, I go to the local pub the Kings Arms and Wetherspoon’s wearing my collar each Wednesday to make myself accessible to the local people who might want to chat. The more Catholic end of the spectrum of the Church teaches us a lot about the power of presence, of the importance of ‘just being there’ and ‘being available’. Keeping the rumour of God alive. Putting a human (and smiling approachable) face on the faceless institution of the Church. Over the years’ I have been here much of my thinking and efforts has been about learning to be good guests on other peoples’ turf, being prepared to meet people where they are at, where they go and where they hang out, rather than our somewhat naïve and arrogant idea of expecting them to ‘come to us’. One of the project I have worked hard with is the setting up of the Kingswood Street and School Pastors, where Christian volunteers wander around our local communities where we try and make it as easy as possible for those who want to chat to have a conversation with a Christian. Friendly, accessible, warm approachable, sadly not words we always associate with Church. Yet, we want to offer more than just a conversation on a street corner, but the opportunity for a longer conversation if people wanted, being in the same place at the same time regularly, so that people if they want to can join us. We soon discovered that for most people -even if we’d had a good chat with them- never came to a Church service on Sunday (despite many saying that they would), maybe it was just too bigger jump for them? Perhaps having a chat in a pub was more of a manageable step for people. This is something we have been doing regularly in some form for the past 4 or 5 years, in different pubs, and trying different things. Sometimes I have been joined by another Christian friend -or two-, and sometimes just on my own, sometimes no conversations with anyone at all, other times have birthed some wonderful kingdom opportunities, and some new friendships -this week was invited by a couple of guys who aren’t Churchy to join their team for the pub quiz, which was a lot of fun even if we didn’t win! Recently we changed or format again, my friend Mike who runs the pub called the Kings Arms (what a fab name for a Church!) has let us use a side room to meet up in, so we have started our evenings with a bit of prayer and one week my friend Wes brought a guitar and we worshipped a bit (if you are interested in hearing more about it, do check it out here….). Interestingly God has been speaking to Wes about the power of worship, somehow worship seems to alter the spiritual DNA of the place. In the summer at an outreach event, Wes and his team had some worship on the streets, with preaching and flyers, the manager of the shopping centre stopped the flyers and the preaching, but allowed the worship to continue, yet it was through the worship which led someone to pray a prayer of commitment. Worship is powerful, worship changes things, worship changing us. So, we decided to do a service in the little room, with the hope that people could drift from the bar and join us, in many way this was doing a service almost as a prophetic action to say we believe that Church will be birthed here. I’d asked my friend Regan to do a bit of a talk. I’d sent out emails, put it on facebook, but still was worried that no one would come. Regan was the first to arrive, which made me feel more worried, if no one showed up it would feel more awkward, especially if Regan had spent ages preparing this would be uncomfortable. Yet gradually a few people came, in fact there was about 6 of us. My friend David led some worship songs on the guitar with the words printed out on a bit of paper. I looked around, we were quite a broad mix really, mix of ages, from different Churches, everything from AOG to Roman Catholic. It felt somewhat self-conscious knowing people could hear us praying and our worship, it felt a bit like a step of faith stick our neck out for Christ. Although we just singing a few songs accompanied by a couple of guitars, but there was a real sense of God’s presence, everyone there was hungry for more of Gods Kingdom to break into our community. Was this Church? -Yes! Rowan Williams defined Church as “an intentional community centred around Christ Jesus”. Do we make Church too complicated? Do we make Church too static and inflexible? Are we far too bound up by our buildings? Our we too wedded to our history of the hallowed Sunday morning hour ideology which has no scriptural base? My heart longs to be a simply Church, flexible, deployable but still being authentic church community moving into the heart of our community. As we worshipped a sense of God’s presence was tangible, perhaps in this season God is longing to be encountered rather than just explained? Then my friend Regan shared a few words, mainly his testimony, was reminded afresh of the power of our story, interestingly this is the most common question I get asked? “What made you go religious?”/ ”Why did you become a Vicar?” -people want to know our story. When we encounter people and they see that in many ways we are both Christians and people like them, that brings an unsaid challenge that ‘people like me can be Christians’. Perhaps part of the failure our Churches is they simply don’t look like the communities in which they are situated? Within his testimony, Regan spoke about his journey of faith, he spoke of how one of his relatives in Zimbabwe used to pray for him regularly, and I wonder how many of the people in the pub that have anyone who is praying for them? I was reminded too, by Regan’s story of the centrality of Christ himself in the role of mission, who would have thought that a struggling, middle class church of largely elderly people would mainly reach and disciple a young 20 something Zimbabwean? Yet, by the power of God’s Holy Spirit, the impossible -or at least the highly unlikely- happens. This reminded me of that wonderful verse “They overcame by the blood of the lamb and the word of their testimony”. The power of our story placed here by John the author of Revelation side by side with the blood of Christ. Regan then shared about a wonderful older saint at his work, who came up to him once and offered him a Bible, which he declined (somewhat rudely!). Yet, I hope that this side of eternity, this lady will come across Regan doing what he does best telling people straight about Jesus. Maybe this lady felt like a failure at mission because she was given ‘short shrift’ by Regan, but he bravery and almost certainly her prayers echoed in eternity and have had an effect she could have only dreamt of. My friend Kaja shared how she was so angry at her sister for having the disrespect and audacity to talk to her about her new-found faith, and yet several hours later Kaja herself said she was on her knees inviting Christ into her life. Sometimes we don’t know the fruit that God brings to birth, often what feels like failure could be slower birthing fruit. Maybe when we step out in faith, we need to remember that “one plants, another waters’, but God makes it grow”, remembering too that “God’s word does not return to him void”. Then as we wandered talking to people in the Kings Arms and Weatherspoon’s, Kaja and Wes met a couple of people ended up bumping into a Christian and sorting out some exciting stuff to do with the local foodbank in Fishponds -made me wonder when we intentional give God time and space he will uses our offering for his glory and sometimes divine and Kingdom advancing appointments. It was good to chat to one another too, it made me think about how formal Church is and we rarely spend time with one another, ironic as one of the Churches I lead has its tag line “where strangers become friends and friends meet with Jesus” but perhaps we stay a little too much like strangers? I used to say “I don’t want to be a Church that is friendly, rather I want to be a Church where people can make friends in”. I ended up chatting to my new friend John, a Catholic, and was so encouraging to hear what the Holy Spirit is doing in the Catholic Church, it makes me realise that although we come from different places, and do different things, that the Spirit of God is not confined by our differences and is bringing glory to Jesus through all those that seek him. I had a brief chat with a guy I’d met at the foodbank, who came up to me and shook me by the hand and said that “although I’m not religious, I want to thank you for what you do”, which was a massive blessing, as I have recently felt really discouraged of late and this meant more than he could know (in fact I see it as a mini miracle as -sadly- this very, very rarely happens!). On our way out of the pub, at the end of the evening, we ended up having a conversation with two guys about the Street Pastors project, Church, life, compassion although we never gave them a ‘full gospel message’ it again felt like this was again a Kingdom advance life blessing conversation. So, why not join us, on a Wednesday, 7:45 for some worship and prayer, followed by a drink and being open to meet whoever we meet, giving the evening to God for his glory and see what happens, making new friends, going deeper with one another, perhaps conversation too which may change peoples’ eternal destinies? God offering each of us the opportunity to partner with him, not hidden away in some Church, talking churchy stuff with already churchy people, often naval gazing. Let’s step out and meet him where he always has been in his world longing to meet his people who don’t yet know him.